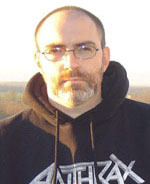 This blog entry about Brian Keene’s appearance and schedule at AnthoCon originally appeared on his website, http://www.briankeene.com/. Saturday, Nov. 12, from 9:00 a.m. to 9:45 a.m. – Keynote Speech: I’ll be focusing on some of the themes I’ve been discussing in my Seminal Screams column for Shroud Magazine, as well as some of the nonsense that’s taken place in our genre over the last few years. Regardless of whether you’re a reader or a writer, I think you’ll enjoy it. There may be cursing. And whiskey. At nine o’clock in the morning.